Still... it was quite easy and efficient in one of my projects to use Dialogue Plugin as "screenplay plugin". One of the biggest advantages is that I can easily analyze such graph from code. And use this info to pre-load assets soft referenced in "upcoming" nodes, read the path leading to specific node aka "specific moment in story" (one of things needed for automated testing). That's why I'm happy that you addedd copy-paste functionality. Thanks! Hi CodeSpartan, before all 4 of us buy your plugin, we have 2 questions. a, For our lip sync system to work, for every section spoken, we need to send an event which contains the string info, as our lips sync system needs to analyze the text itself. b, do you plan for the future, to create a way to create an interface for creating multiple language variations of the text? The first thing can be done my slightly modifying the UMG widget. 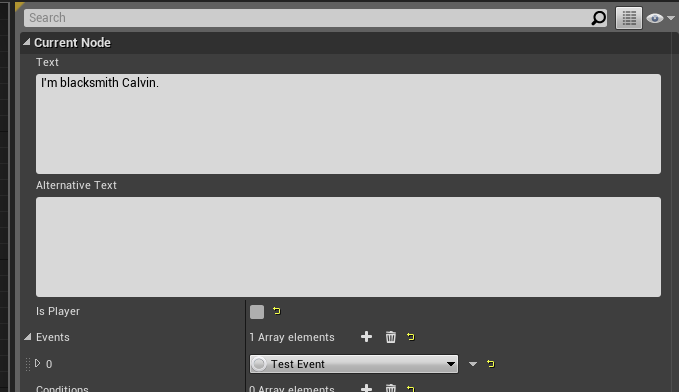 When a text line is displayed, simply call your lip-sync method with the same text as parameter. I'll show you exactly where this can be done if your programmers can't find it. It's a small widget, there's not much stuff in it. Just shoot me an email if you need assistance with this. The second - the plugin is configured to work with Unreal's native localization system, which does everything you might need. But looking in the DialogueUserWidget.cpp I'm not seeing world being assigned, unless it's coming from elsewhere and you're referring to the order of execution. Basically I just need a way to get the game mode through the conditions, and probably from events as well, but I haven't checked there. Thanks for reporting it. I forgot to make World available inside conditions. I made it work for events (get game mode would work there), but forgot to do the same thing for conditions. I'll upload a fix right now, and it'll probably get published tomorrow or the day after. In case you want to patch it yourself, here's the diff. Last edited by CodeSpartan; 08-05-2018, 09:41 PM. No problem, thanks for the quick fix and notes. Did you get that from Zh Khang Shao? I ran into his post while trying to figure it out. Bit over my head, but seems brilliant. I'll also say that your move to make condition and event objects was genius, really opens up possibilities. I will ask though, off the top of your head can you think of a way to link the text in the dialogue nodes to another text. As an example, the option would say something like "accept" and then send a linked text to a separate widget with actual dialogue. Already know to link to other widgets/ widget components so that's not a problem. I haven't delved into your data asset code for the dialogues and nodes myself, but if I do before you reply I'll edit this message. No problem, thanks for the quick fix and notes. Did you get that from Zh Khang Shao? Can't take credit for it. This was suggested to me by Michael Brune from Underflow Studios. I will ask though, off the top of your head can you think of a way to link the text in the dialogue nodes to another text. As an example, the option would say something like "accept" and then send a linked text to a separate widget with actual dialogue. If I understood you correctly, then what you want to do is simply create an event with a Text field, and the logic of the event would open a separate widget and put the Text parameter into the widget. Unless I misunderstood, of course. I didn't quite get what you mean by "separate widget with actual dialogue". Last edited by CodeSpartan; 08-09-2018, 07:40 AM. For the seperate widget I meant that I use a widget component on npc's to display their nodes of the dialogue directly above them. I probably should have thought of that myself, though I think I'm going to first try to add another text field in the nodes themselves, one which will display an overview of what the reply will be, and then another field that will be the spoken words. The spoken words I may create another widget for the player to make their spoken dialogue appear above their own head. Let me know if you need assistance with creating a second text field and displaying it inside nodes. Seems a lot simpler than I had expected. Should be I just need to add an FText variable in the FDialogueNode struct, then in BP in the reply widget is where I get the break DialogueNode that has the variables, which I assume is really all I need? I was looking in your source and found the TextCommitted() in DialogueNodeWidget.cpp as well as the OnNodeTextCommitted() in DialogueViewportWidget.cpp. 99% I don't need to touch the dialogueviewportwidget code as I assume that strictly for the text on the node, and about 90% certain I don't need to touch the dialoguenodewidget. Problem is adding a variable FText isn't showing up in the widgets or bp. Checked the break node and it's not there either. Simply copy/pasted the Text variable and changed the name. Also, would it be possible for you guys to add blueprint style comments to your dialogue viewport? Just makes things easy to organize and shows relevant details at a glance, but I can just as easily use unconnected nodes. If it has, check that it functions correctly, and check if the Ctrl+Z works correctly. Definitely a good idea, but also a very difficult thing to do, unfortunately. So not for the foreseeable future. Though the alternative text isn't popping up unfortunately. Did a direct copy and paste so as to avoid any errors on my side. Also deleted saved, binaries, and intermediate -> generated vs files -> built solution then re opened the project but no luck. Last edited by iSpam; 08-12-2018, 12:21 PM. Have you copied the plugin from the engine into the project? If so, have you also removed the plugin from engine (in Epic Launcher)? Last edited by CodeSpartan; 08-12-2018, 01:26 PM.